Eczema is another word for dermatitis, which is inflammation of the skin. There are many types of eczema, although the term has incorrectly come to be associated with a specific type of dermatitis called atopic dermatitis. Atopic dermatitis is a chronic, noncontagious condition that causes itchy, inflamed skin. Atopic dermatitis (eczema) most commonly affects the insides of the elbows, the backs of the knees, and the face, but it can affect any area of the body. In rare cases, it may cover most of the body. 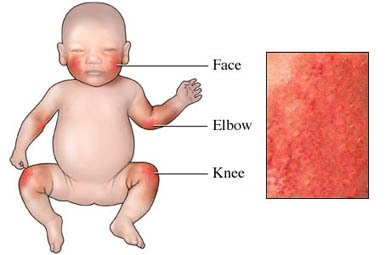 Although atopic dermatitis can develop at any age, it is most common in infants and children. More than half of people with atopic dermatitis develop symptoms in the first year of life, and almost all develop symptoms before age 5. The condition often improves in adulthood, but half of those affected as children are affected throughout life. In the United States, it is estimated that 28 million people have eczema. The exact cause of atopic dermatitis is still unknown, but current theories suggest that it is related to an abnormal immune response and genetic factors. Atopic dermatitis is often associated with other hereditary allergic disorders, such as hay fever and asthma . What are the risk factors for eczema?What are the symptoms of eczema?How is eczema diagnosed?What are the treatments for eczema?Are there screening tests for eczema?How can I reduce my risk of eczema?What questions should I ask my doctor?What is it like to live with eczema?Where can I get more information about eczema? Atopic dermatitis. EBSCO DynaMed Plus website. Available at: http://www.dynamed.com/topics/dmp~AN~T115212/Atopic-dermatitis . Updated July 3, 2017. Accessed December 21, 2017. Eczema. Kids Health—Nemours Foundation website. Available at: http://kidshealth.org/parent/infections/skin/eczema%5Fatopic%5Fdermatitis.html#. Updated June 2015 . Accessed December 21, 2017. Eczema. National Eczema Association website. Available at: http://nationaleczema.org/eczema. Accessed December 21, 2017. Eczema and atopic dermatitis. Family Doctor—American Academy of Family Physicians website. Available at: https://familydoctor.org/condition/eczema-and-atopic-dermatitis/?adfree=true. Updated June 2017. Accessed December 20, 2017. Plötz S, Wiesender M, et al. What is new in atopic dermatitis/eczema? Expert Opin Emerg Drugs. 2014 Dec;19(4):441-58.